A+ Motel and RV Park – Lake Charles, LA, March 2015. A very nice park with lots of permanent sites but not cluttered at all. The pool is very nice and the exercise room, however the spa was not heated. We stayed here for Paul to work but the area looks very nice with lots of recreation nearby. 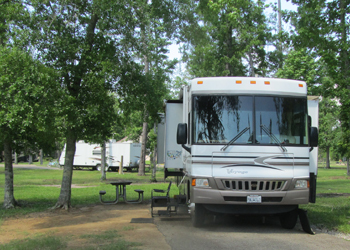 Abbeville RV Park, March 2015. A very nice park with lots of space between the sites. Small, full hookups and the Owls are amazing. We stayed here as Betty’s didn’t have a spot when we arrived. We moved to Betty’s for the happy hours but this place is definitely much nicer! Betty’s RV Park – Lafayette, LA, March 2015, May 2009. A great place to stay. Small sites but it doesn’t matter, Betty is amazing and the happy hour is the best. The area has so many great places to explore and eating is too much. FountainBleau State Park – Mandeville, LA April 2012. Beautiful park on the north side of Lake Pontchartrain with nice sites. A great beach on the lake. Great restaurants on the Lake within 2 miles.